Now that is how you kick off a playoff run. 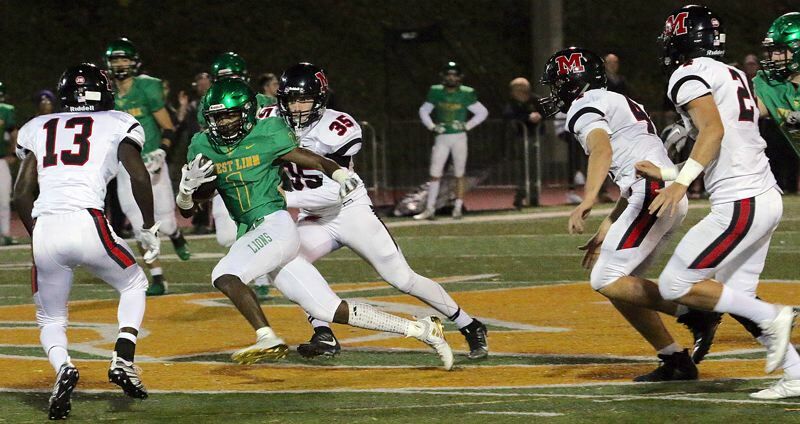 The sixth-ranked West Linn Lions opened the second season with a flourish, dropping 70 points on McMinnville in their 70-35 Friday victory in the first round of the Class 6A state playoffs at West Linn High School. Indeed, the Lions were so productive offensively — they led by 42 at one point — that they even made West Linn coach Chris Miller smile. "We scored 70. That generally works," Miller said. With the win — sixth-ranked West Linn's second straight — the Lions improved to 7-3 overall after tying for third place in the Three Rivers League. Next up, West Linn will face 11th-ranked TRL foe Lakeridge (7-3 overall after tying the Lions for third in the TRL) in the second round of the playoffs at West Linn High School at 7 p.m. Friday. In the two teams' regular-season matchup, the Lions beat the Pacers 45-28 at West Linn on Sept. 21, though Lakeridge trailed by just one score until the final six minutes of the game. So, what will it take to beat the resurgent Pacers — they've won four of their past five — in Friday's second round? "To beat Lakeridge again, we have to contain (Lakeridge junior running back Jalen John), handle (senior wide receivers Andre Martinez and Will Scadden), pressure their quarterback, continue to roll on offense and take care of the football," Miller said. No. 27 McMinnville, meanwhile, lost its third straight game and finished its season with an overall record of 5-5 after tying for fourth place in the Pacific Conference. The Lions had the accelerator mashed to the floor right from the game's outset, getting a 5-yard touchdown run from senior quarterback Ethan Long, a 44-yard Long TD pass to junior wide receiver Casey Tawa and the first two of senior Abdul Ali's 10 extra-point kicks to grab a 14-0 lead at the end of the quarter. West Linn then hit high gear in the second quarter, scoring another four touchdowns in the period to take total control of the contest. While the Grizzlies managed to score two TDs themselves in the period, the Lions' lead ballooned to 42-14 at the half. Long connected with senior wide receiver Jake Mastrandrea for 18 yards to start the quarter, and after McMinnville got a 22-yard Sam DuPuis TD pass to Kevin Sullivan, West Linn senior running back Dawson Jolley ripped off a 34-yard scoring run next to make it 28-7. Long was back at it again with a 1-yard touchdown pass to junior tight end Damiko Tidmore Jr., and sophomore running back Gavin Haines hit paydirt from 2 yards before the Grizzlies tacked on a 2-yard scoring pass from DuPuis to Ian Wilson with 28 seconds left before halftime for that 42-14 West Linn lead. The Lions just kept rolling in the third quarter, adding another three touchdowns to their night's work and pushing their lead to 63-28 at the end of the stanza. Long hit senior wide receiver Cade Knutson for the first of those scores — a 34-yarder — and connected with senior wide receiver Tanner Moore on a 9-yard score. After that, Jolley broke loose for a 53-yard scoring jaunt. McMinnville's scores in the third included a 69-yard DuPuis-to-Tanner Farley TD pass, and later, a 2-yard strike from DuPuis to Farley. West Linn junior quarterback Ethan Coleman found junior wide receiver Ethan Loun for the Lions' final score, an 8-yard strike that helped their team's lead crest at 70-28 in the fourth quarter. The Grizzlies' final score came on a 44-yard pass from DuPuis to Sullivan. For the game, the Lions ran for 403 yards, with Jolley picking up 250 and three TDs on 14 carries (he's gone over 300 yards in total offense for the second week in a row) and Haines adding another 114 yards and one score on 12 attempts. Long — who's now amassed 10 TD passes and two TD runs in his last two games — went 15 for 20 passing for 263 yards and five touchdowns. Mastrandrea led West Linn receivers with four catches for 84 yards and one TD, while Tawa added three grabs for 68 yards and one score, and Moore five catches for 66 yards and one TD. The West Linn defense limited McMinnville to just 58 yards on the ground, while DuPuis went 23 of 39 for 314 yards and five touchdowns with one interception. Sullivan made 11 catches for 141 yards and two scores, and Farley six grabs for 130 yards and two scores.